Take the bus or the Trolley, it’s EZ and affordable! Just next door to Foxwood Apartments at Delcardo Avenue (Stop ID: 60481) you can board Bus 933 and within approximately 10 minutes you arrive at the Palm Avenue Trolley Station. From there it’s an easy 20 minute trolley ride to 32nd Street Naval Base (Pacific Fleet Station). You can also take the 933 bus to Palm and 9th Street in Imperial Beach in approximately 20 minutes. Then transfer to the 901 bus which will take you to Naval Amphibious Base Coronado (Silver Strand) in approximately 10 minutes or continue on to Naval Air Station North Island front gate in approximately 15 minutes. Day passes are good for unlimited use all day on both the bus and trolley. Monthly passes are sold at any Vons store or Trolley Centers. Click here to see the Bus and Trolley Schedule for information on routes to 32nd Street Naval Base, Coronado Naval Bases, Downtown, Mission Valley, Tijuana/US Border, San Diego Golf Clubs, Shopping and Beaches. 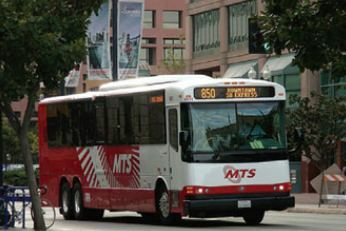 MTS provides full Bus routes and a Bus Map available for download on their web site. 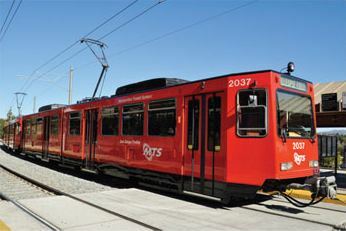 One of the more recognizable landmarks in San Diego, the Trolley is a fun way to get around! It’s just 10 minutes away by car or bus.